If you're using ASP.NET Core Entity Framework (database first) you may have to rebuild your DB context and models frequently. 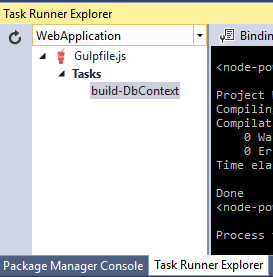 Instead of manually running "Scaffold-DbContext" in package manager console and updating the DBContext (as per https://docs.efproject.net/en/latest/platforms/aspnetcore/existing-db.html), you can speed things up with a Gulp task. 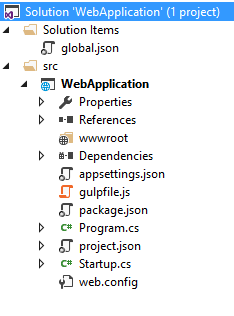 You can create a Gulp task and use the "node-powershell" to quickly run the scaffold command in dotnet CLI and automatically remove the hardcoded connection string from the Context class. This can then be quickly executed in Task Runner as you need it.